Hi friend! You may have noticed a theme around here lately and it’s all things smoothies! It’s that time of year when you are likelier busier than ever, but in the absolute best way possible! It’s warm and bright outside til much later, there are tons of events and festivals going on, and restaurants have opened up their patios. With all these funtivities to partake of, it can sometimes be hard to sit down to make a fully nourishing meal. Plus if you’re anything like me and it takes you an hour to eat a salad, the best option can be to start your day with a smoothie that you’ve jam-packed to the gills with the absolute best nutrition possible. Smoothies are great on-the-go foods that have all the convenience of “fast food” and none of the icky side effects of scarfing down what amounts to poison. 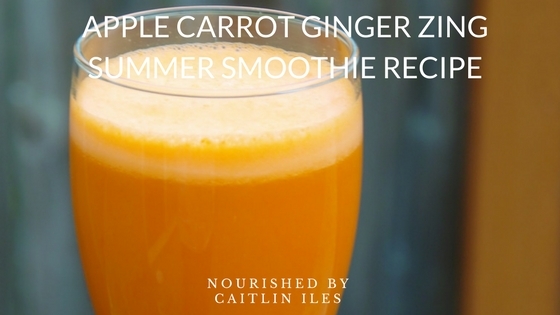 Plus with all the amazing produce out there, the options and permutations of smoothies is virtually limitless, and so today I wanted to introduce you to one of my favourite zingy creations. This bad boy is guaranteed to put some pep in your step and give you the energy to face your busiest days with vim and vigour! Turns out that age old adage “An apple a day keeps the doctor away” has its foundation in scientific fact! Apples contain some great nutrients that help balance our blood sugar and boost our immune function. Apples also contain quercetin, which boosts your immune system. Quercetin inhibits enzymes involved in the breakdown of complex carbohydrates into simple sugars such as alpha-amylase and alpha-glucosidase. Again, if you body has fewer simple sugars to deal with your blood sugar will be much more likely to remain in a stable, healthy range. The vibrant orange color found in carrots is a sign that it contains tons of beautifying beta-carotene. BC is amazing for skin, hair, and nail health thanks to its antioxidant function in the body and because it is the precursor to vitamin A. This vitamin is necessary for building healthy epithelial tissues in the body and because it promotes healthy cell division, helps regenerate collagen, regulates oil production, and helps protect your eyesight as you age. They also contain biotin, which is a B vitamin that helps regulate blood sugar and promotes healthy hair growth! This humble little root is jam-packed full of nutrient goodness! Specifically, it contains special phytonutrients called gingerols that have some pretty wicked anti-inflammatory properties. Managing inflammation in the body is probably the most important aspect of achieving a state of vibrant good health, after high-functioning digestion that is! And wouldn’t you know it, ginger is also a spectacular digestive aid? It’s great for soothing digestive distress, soothing the intestinal tract, and reducing gas so that you can digest and absorb all the goods you’re taking such great care to eat. Once absorbed all the amazing nutrients get to work building shiny hair, glowing skin, and strong nails and bones so you literally start to glow from the inside out! Well there you have it friend! A super charged smoothie to see you through all the festivities and adventures summer brings your way. Thanks for stopping by and I hope you have a wonderfully whimsical week!